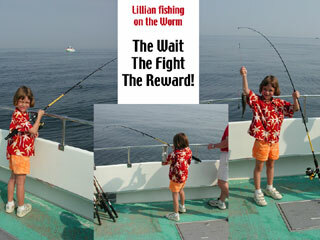 And here's Gail Randall with a fine rockfish she caught on June 30 aboard the Worm. 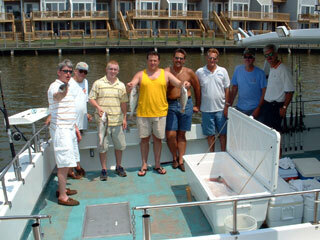 And now the Paul German crew, getting ready to catch their rockfish limits on June 30. From left to right, that's Gary, Gretchen, Paul, Mike, and Tom. 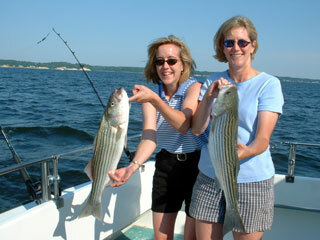 Here's Gretchen, cranking on a nice striper. The belt really helps put some leverage on the rod. 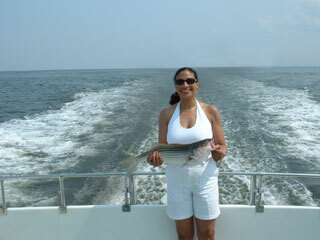 And the end product, a fine 28 inch striper, largest of the day. 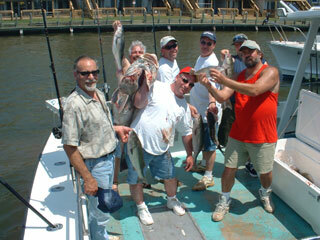 And here's the Paula Jones crew, with a great catch of stripers and blues from June 29. From left to right, that's Nancy, Paula, Ralph, Buzz, and Bob. Nice catch guys. 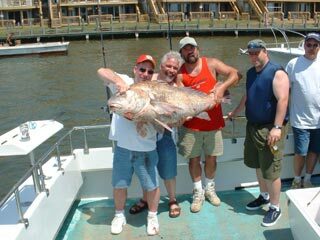 And here's a crew from Uniboard/North Bay, led by Bill Sabo (far right), shown with some of their fine catch on June 28. 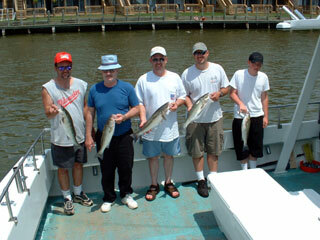 From left to right, that's Mark, Jim, Don, Corey, Bill, and Bill. 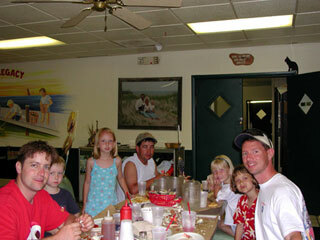 And back again we have the Fred Gers crew, along with regulars Larry, Art, Rick and the rest of the crew. 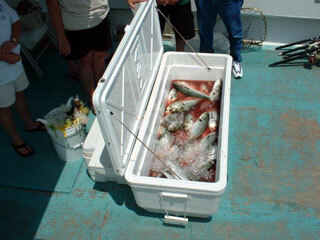 A good load of rockfish and blues was caught. 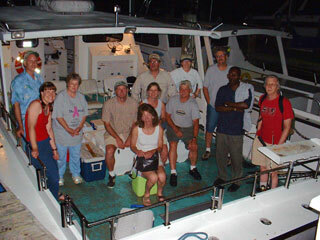 Here we have the June 24th crew from the Smithsonian Institution, led by Carla Dove and Claudia Angle. From left to right, that's TBD, Christina, Linda, Chris (seated), Claudia (front), Carla (seated), Phil, Sam (seated), Marcy, Bill, Wiltshire, and Rick. 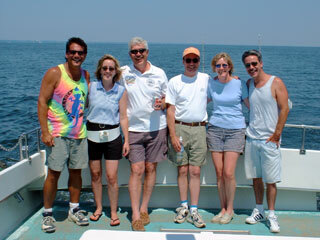 For more crew photos, click here. 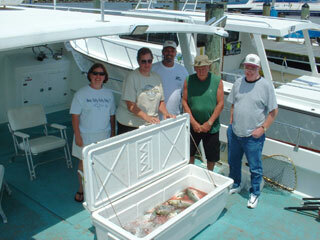 And here we have the Steve Kerns crew from June 23, shown with some of their catch of rockfish and blues. From left to right, that's Dave, Bill, Greg, Steve, and Andrew. 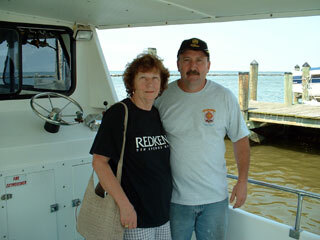 And that's Buddy Duvall on the right, a frequent fisherman on the Worm, with his Mom, just before a fine dinner at Beach Cove. 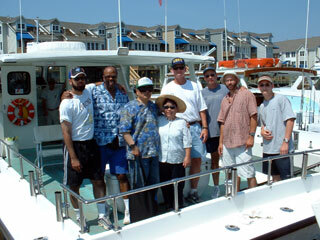 Here we have the Towson crew from June 22, shown without their fine catch of rockfish and blues. 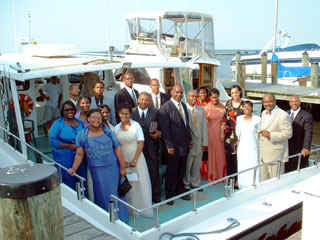 And here we have some graduating high school seniors and chaperones who were treated to a short cruise on the Worm and then dinner at the Rod 'N' Reel by their church, the Church of God in Lothian, MD. For more photos, click here. Congratulations grads! 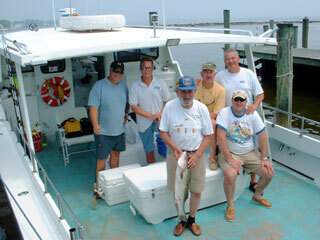 Here's the Dave Reynolds crew from June 25, shown with their limits of rockfish and a number of blues. Here's the June 14 crew from NetCom Inc., led by Roy Owens (far left). 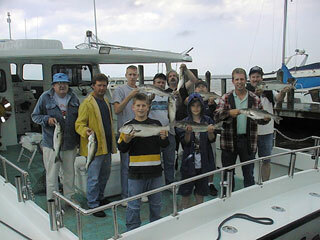 Shown with some of their catch of rockfish and blues, (from left to right) that's Darryl, Clark, Glen, Steve, and Ryan (front). 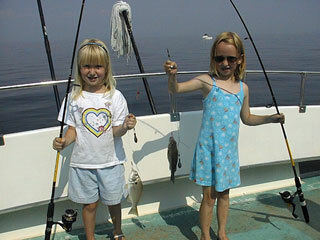 Every once in awhile the Captain gets to fish with family members, like his two daughters Emily and Tiffany, shown here with a couple nice white perch. 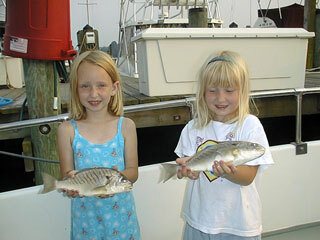 And here's a close-up of the girls with some jumbo spot. 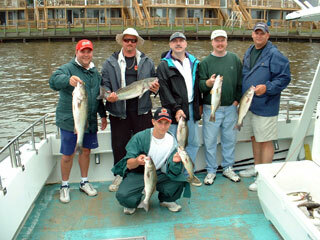 Here we have the Benny Mitchell crew from June 9 with their limits of rockfish. From left to right, that's Gloria, Joe, Dean, Greg, Benny, and Earl. 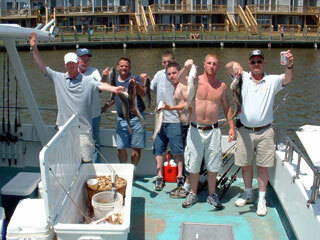 Back again here we have the Art McCrea crew from June 6 with their fine catch of rockfish and croakers. From left to right, that's Miles, Hazen, Shawn, Scott, Mark, Art, Fred, and Gary. Nice catch guys. 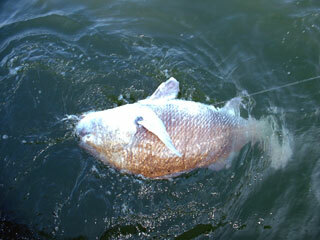 It's June 1 and the black drum must be back. 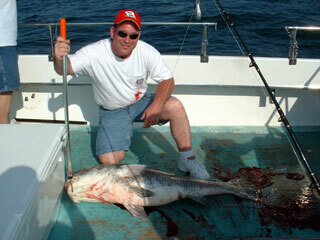 Here's a new boat record for the Worm, an 84 lb. 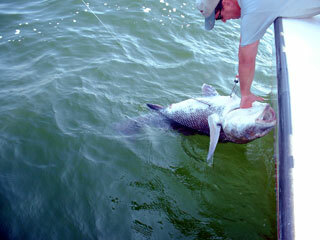 monster black drum, caught by one of the crew from Montage Inc. Here's Captain Drew, about to wrestle the monster into the cockpit -- with lots of help. 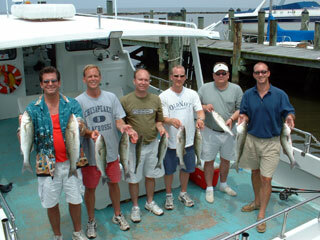 Here's the whole crew from Montage with their limits of small rockfish. From left to right, that's Jody, Neal, Matt (trying to hoist his trophy), Mark Crockett (crew chief), Cortland, Mike, and Mike. And here's the crew from CV Security, led by Lou (far right). From left to right, that's Keith, Barry, John, Allen, Chris, and Lou. 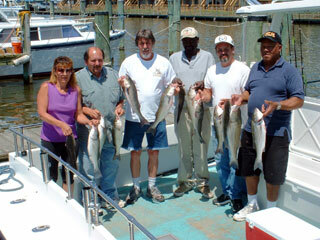 After catching their limits of rockfish, we managed a decent number of daytime croakers.